Hi all, and a happy new year. During the holidays, I took up this book from a shelf (I knew it came from Auntie Olive, or perhaps Monsieur Père), and decided to re-read it - I remembered nothing apart from the title! But I must have read it in the early 1970s (in fact I finished it on Nov 14, 1973, just found the entry in the diary of that year! ), and I think it must have been extremely difficult for me at the beginning, vocabulary wise. I no longer have the wonderful spooky cover at present (this is an internet pic), don't know where it went, what a pity! The scene described is on page 96 when the three heroes are caught running away from the searchlight coming from the enemy spaceship which has just landed on (lost) planet Hesikos in search for a telepathic instrument called "the Electronome", with a bad guy called Otto Shenk leading them. They are being shot at, but manage to get into their jeep unharmed. Nevertheless, the enemies also have jeeps, and race them. They catch up, because their engines are newer and more powerful. Fireshot resumes, closer and more and more dangerous. They can only hope for a miracle... and it happens! I'll stop there to avoid spoiling the story which no doubt the scores of readers of this blog will rush to read!! 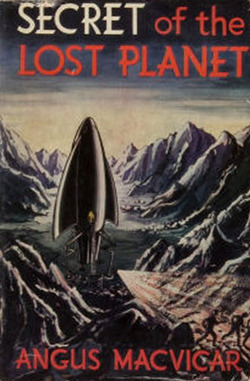 Indeed the book belonged to a series, with "The lost planet" as n°1, then "Return to the lost planet". "Secret of the lost planet" was n°3. As I was reading, the allusions to the previous episodes kept reminding me that I was reading a sequel, but this doesn't take away the pleasure. The fun comes from the sci-fi suspense atmosphere, where clear-cut characters are immediately recognizable and the optimistic vision is paramount. Apparently the series was very popular! There were 8 books in it. The novel belongs to its 1950 context, when the Cold war was a threat, especially through its allusion to "atomic" things: an atomic motor to power the spacecraft, atomically charged water as fuel (I suppose Angus McVicar was confident that children would never check what was behind this bogus science), and most of all, the "atomic gun" which is used to penetrate the underground city! 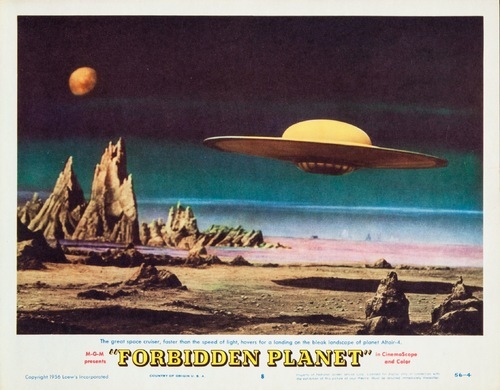 I wonder if and how much of the book (or series) has been used in the 1956 movie Forbidden Planet, because there are a good number of elements which are similar. On IMDb, they say the screenplay was written by a Cyril Hume. Anyway, what striking is the mention of a ancient civilization on a distant planet, an underground city guarded by a sliding door with airshafts, a mysterious Power source based on electricity and telepathy, a father and his daughter on the planet and in the spacecraft some men with a funny cook. Who knows? Have you seen it? Or read the book?